MANSFIELD, Mass. – The story of the day was turnovers. And the good news for Mansfield is that they won that battle against Taunton. 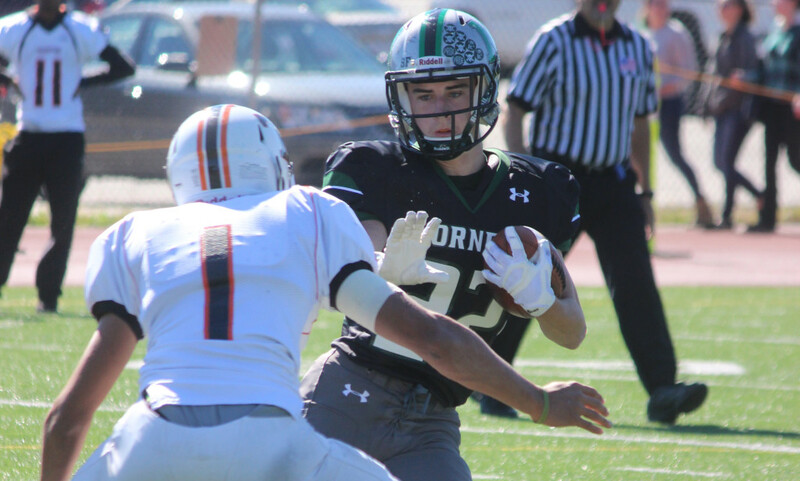 The Hornets forced five of them, four interceptions and one fumble, and turned them into a 32-14 win over the Tigers on Saturday afternoon. The weird thing though was the fact that Mansfield was only able to get 3 points from the five turnovers. Meanwhile, Taunton turned both of their interceptions into touchdowns. “The plus side, our defense the last three weeks has been great, but the thing we haven’t done is get turnovers,” Mansfield head coach Mike Redding said. “Today we had four interceptions, we finally forced turnovers. The negative is we didn’t take advantage of them as much as we should have. Mansfield’s offense was able to score at the right times though. After the teams traded punts to start the game, the Hornets needed just four plays to cover 41 yards to find the end zone. The first two plays even went for negative yardage but junior quarterback connected with Ben Budwey for 29 yards and sophomore Joe Cox took the next play 15 yards into the end zone. Diogo DeSousa’s extra point made it 7-0 with 5:38 left in the opening quarter. After two more punts, the Hornets were able to get their first turnover of the day when Mansfield’s Ben Wisnieski intercepted Jared Taje’s pass near midfield and raced all the way to the 16 yard line. The momentum swing didn’t last long though as on the first play, DeGirolamo was intercepted in the end zone by Carlos Borrero. Taunton was about to turn its first takeaway into eight points, driving 80 yards on 11 plays. Taje connected with junior Adam McLaughlin twice for a total of 48 yards and then hit Tanner Costa over the middle for 21 yards on third down. Taje tried to link up with McLaughlin in the end zone but a defensive pass interference call put the ball inside the five yard line. Damion Theodule was able to punch it in from two yards out while Costa rushed in the two point conversion. Taunton took an 8-7 lead with 5:54 left in the second quarter. Although Mansfield couldn’t capitalize on their first takeaway, they were able to respond to Taunton’s touchdown drive. The Hornets used 10 plays to go 59 yards before regaining the lead. Without leading rushers Brian Lynch and Connor Finerty playing, Nick Graham (10 carries, 72 yards), Connor Driscoll and Cox (14 carries, 76 yards) all moved the ball up the field on the ground. DeGirolamo went back to the air and hit Budwey right on the one yard line. On the next play, Graham found a hole and punched it in. Driscoll’s two point rush gave Mansfield a 15-8 lead with just 35 seconds in the half. The Tigers attempted to get something going before the end of the half but Wisnieski was there again for an interception. Mansfield’s offense moved some but were forced to attempt a 39 yard field that was short as time expired in the first half. Driscoll put an end to Taunton’s opening drive of the second half, picking Taje off on first down. Mansfield’s offense also stalled though, going four and out and were forced to punt. But that was fine as the Hornets’ defense again came up with a stop. Mansfield’s ensuing drive got a boost to start when Taunton was flagged for fair catch interference. DeGirolamo hit sophomore Hunter Ferreira on first down for 20 yards and two plays later, Graham just raced through the defense for a 12 yard score to make it 22-8 with 4:13 left in the third. The Tigers fumbled just two plays into their next drive and for the first – and only – time in the game, Mansfield was able to turn a takeaway into points. Diogo DeSousa hit a 24 yard field goal to extend Mansfield’s lead to 25-8 shortly before the final quarter. Two plays into the next series, Joe Bukuras came away with Mansfield’s fourth interception on the game but DeGirolamo was intercepted by McLaughlin in the end zone for a touchback. Greding inserted sophomore Collin Hunter in at quarterback on the Tigers’ next drive and was rewarded. Hunter connected with McLaughlin for six yards and then hit Michael Fernandez for 22 more yards. A short completion to McLaughlin was once against followed by a completion to Fernandez for a first down. The next to passes went to McLaughlin for 34 total yards. Two plays later, Theodule got into the end zone from a yard out to cut the deficit 25-14 with six minutes to play. On the drive, Hunter went 6/6 for 78 yards. The sophomore finished 11/15 for 140 yards in the game. Mansfield capped the scoring with just over four minutes to play when Graham raced in for his third touchdown of the day, this one a 29 yard rush. The Hornets (3-2, 2-1) will look to pick up their third league win next week when they travel to Franklin. Taunton (0-5, 0-3) will try to get into the win column when they take a trip to Community Field to take on North Attleboro.